Email automation: everybody’s doing it. Ninety-one percent of marketers say automation is critical to their success. Companies using automation see 53 percent higher conversion rates than those not using automation. Seventy-eight percent of marketers say that automation makes them money. I haven’t even mentioned all of the time-saving, trust-building, subscriber-educating benefits, but I think you get the point. Email automation gets results. So why haven’t you tried it yet? Maybe you thought that automation was for bigger, more established businesses. Maybe you think you don’t have the time. Or maybe you just have no idea how to get started. Not to worry! Anyone can use automation, and getting started is painless. I’ll show you how to create two basic automation series and all the tools you can use to make it even easier. An AWesome email automation platform. Three to five quality pieces of evergreen content (here’s how to use Google Analytics to find them). Lacking in content? Choose from these autoresponder ideas that anyone can write about. A few hours of your time. These apps aren’t required for you to get started with automation, but they’re here in case you need them. For content: If you’re lacking in content or you’re just not happy with your existing content (been there! ), you need a distraction-free zone where you can write. Give ZenPen a shot. For images: Make your email content prettier with Canva. For targeting: Send highly targeted campaigns with 40 Nuggets. For connecting your shopping cart to your automation series: Connect PayPal, Etsy or Shopify to your account to turn your customers into email subscribers and send them your series. Want to attract new subscribers to grow your following? In the early stages of your business? Just launched your website yesterday? Start here. This series is for your new website visitors. They’re people who aren’t all that familiar with you or your work. They may not have a lot of time to peruse your website, so the goal of this series is to get them acquainted with you. Let’s say I want to promote my email marketing blog with an email automation series teaching folks about…wait for it…email! I’ll turn these three blog posts into an email automation series for prospects so you can see how it’s done. Subject line: Welcome to Email 101! Thanks for signing up for Email 101! Every week, I’ll send you new tips for boosting your email marketing strategy. Want to dig in? Here’s our best split testing tips: 5 Split Tests You Can Run Today to Write More Engaging Email Content. I’d love to hear your feedback on this email or any others. To get in touch with me, just reply to this email. To keep your subscribers engaged, include another popular post in your next message. In this case, I would schedule it a week after my last message since I promised weekly tips. Creating great-looking thank you pages can be a challenge, so I wanted to share a few that have delivered great results. Check out this post: How to Use Thank You Pages to Convert Subscribers into Customers. Have you seen a great thank you page lately? Reply to this message and tell me about it! You’ve probably noticed that while the content I’m sharing in this series has a common theme, all of the topics are a little different and I’m not sharing them in any particular order. That’s OK. Unless you’re creating an email course, a step-by-step guide or other concepts that build on each other, your series can be comprised of an assortment of your best posts. As long as those posts are showing off your expertise and delivering value, you’re all clear. Have you ever heard of the marketing funnel? It’s a tool we marketers use to turn prospects into customers. And once you have a good understanding of how it works, you can use email marketing to get the most out of it. To learn more, check out this article: Understanding the Marketing Funnel: 5 Strategies to Improve Your Email Marketing. Once you share your best content, you should ask your subscribers what they thought about it. You can include a link to a survey or just ask people to reply directly to your email. On a scale of 1-5 (5 being the best), what did you think about the content in this series? Which piece of content was your favorite? Why? What can I do to improve my content? What are your biggest questions about [your industry]? Subject line: What did you think about my blog posts? Now that you’ve received a few pieces of content from me, I’d love to hear your feedback. Would you mind answering a quick questions? Your answers will help me create better content. To answer, just hit reply with your answers to these questions. Be sure to respond to anyone who reaches out with their feedback! At this point, your new subscribers know you better. They might even be ready to buy from you! If you have any paid content or services, now is the time to tell them about it. I hope you’ve been enjoying my articles so far. My goal is to deliver the most impactful tips and tricks for your email strategy. I recently compiled my best tips in my guide, The Best Email Marketing Guide Ever. You’ll learn everything you need to know to create your own email strategy – and execute it! The guide also includes a variety of templates, worksheets and checklists to help your vision come alive. When you promote a paid piece of content, product or service, lead with the benefits. What will your paid content help them do? What exactly is included? You’re asking people to spend their hard-earned money, so give them solid reasons to buy from you. And if they don’t buy? No sweat. Many people won’t. You can continue sending them valuable content to build a relationship with them. And if they do? Go you! Send your customers their own series. Want to turn your existing customers into loyal subscribers? This workflow is for you. If you use a shopping cart, connect PayPal, Etsy or Shopify to your account to add new customers to your subscriber list. If you sell multiple products, sending your customers content based on what they purchased will increase their odds of becoming a repeat customer. In that case, you’ll want to create a series for each of your products (or product types). Now, just because someone is your customer doesn’t mean they want to be sold to 24/7. You should still send them valuable content that is relevant to their purchase as you continue to promote your other products. Here’s what my customer series could look like after someone purchases my guide. Email #1: Thanks for purchasing! In this message, you should thank your new customer and offer them a related product. Subject line: You bought my guide! Here’s another resource you might like. Thanks so much for purchasing The Best Email Marketing Guide Ever. I can’t wait to hear how you put the tips to work for your business. I wanted to let you know about another guide you might like: How to Write the Best Subject Line Ever. It’ll help you write killer subject lines that will improve your open rates. You already know what your subscribers are interested in based on their purchase. Why not expand on some aspect of it? If they bought an ebook, talk about your favorite tips from a particular chapter. If they bought a painting from your Etsy store, discuss your painting style and influences. If they bought your time-management app, send them additional time management resources. Subject line: My favorite email strategy is inside. One of my favorite things about writing The Best Email Marketing Guide Ever was learning real-life strategies from real people. Seeing a strategy at work for an entrepreneur can make all the difference when it comes to understanding how it works. I particularly loved how blogger Felicia Ricci use video in her email strategy. What was your favorite example in the guide? You can use this type of email to gain feedback about your paid product, too. Give your paying customers a first glimpse into what you’re working on. Since you bought The Best Email Marketing Guide Ever, I wanted to give you a sneak peek at another project I’m working on. It’s a new guide that expands on the most popular chapters from my first guide and I’m pretty stoked about it. Your customer series doesn’t have to end there. You can keep sending your subscribers great content while occasionally giving them a heads up about other paid products. Let’s say your prospects have been prospects six months or more. Or you have customers who made a purchase and continue receiving your emails, but they haven’t bought anything in a year. What then? It’s likely that they’re just big fans of yours. They’re not ready to buy, but they love your content and want stay on your email list. And that’s great! But you still want to make sure those people are interacting with your emails. You can run a reactivation campaign to find out if those people are still interested in receiving content from you. From there, you can clean up your list to ensure your deliverability stays strong. A clean list full of engaged subscribers is your ticket to email automation success. Need more help writing emails? We’ve got you covered. 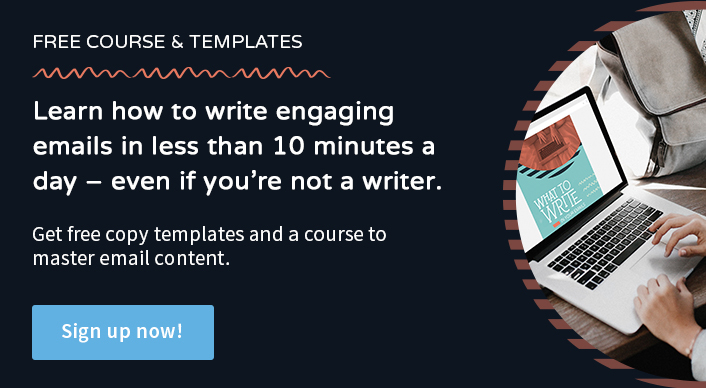 Sign up for our free course, What to Write in Your Emails. What are your biggest challenges with email automation? Tell us in the comments! I really enjoyed this post for sure.